Chewton is a rural township in the Castlemaine goldfields area. It has Victoria’s longest operating gold mine at Wattle Gully. Situated on the Pyrenees Highway and the Bendigo railway line, Chewton is 4 km east of Castlemaine. There is nearly unbroken urban settlement from Chewton to Castlemaine, backed by goldfields heritage parks. 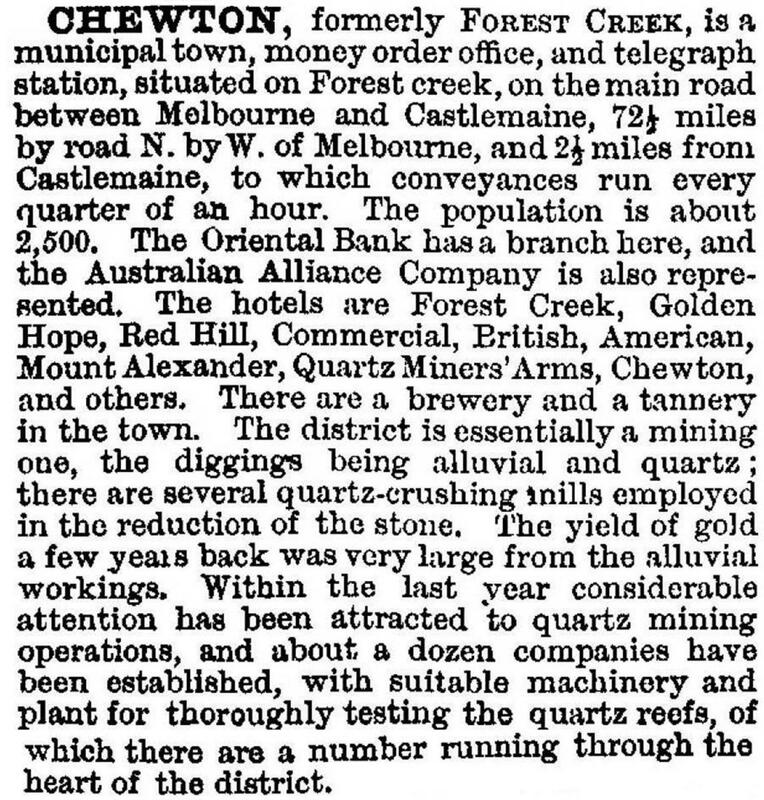 Forest Creek flows from Chewton to Castlemaine, and it was a rich source of alluvial gold shortly after discoveries in 1851. Chewton, first known as Forest Creek, is thought to have been renamed after Lord Chewton, an acquaintance of Lady Castlemaine. (The township of Castlemaine, however, was named after the place of that name in Ireland). From an initial canvas town Chewton acquired a brick and timber township along the curved main road or Pyrenees Highway, which followed the less hilly contours between the ranges which rise to its north and south. Several of the buildings from the 1860s and 1870s remain, hugging the relatively narrow main road. 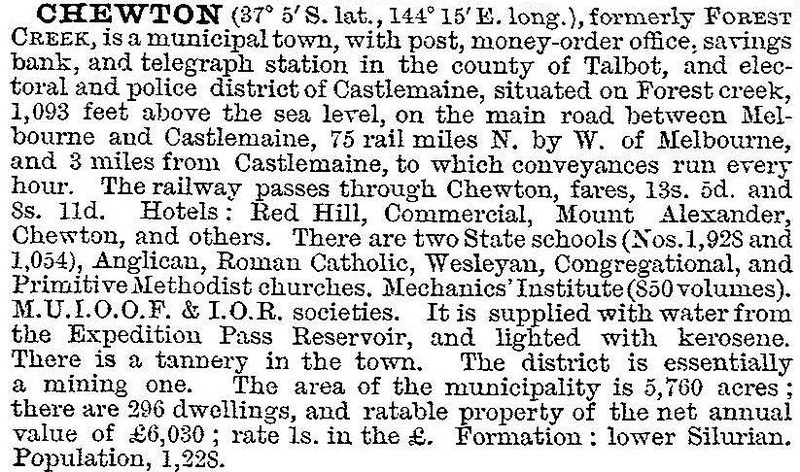 During the 1860s Chewton had a busy commercial sector, with a court, a mining survey office, two banks, 14 hotels, butchers, grocers and blacksmiths. Ten quartz crushing mills served the local mines. The township had been proclaimed a borough in December 1860, governing an area of 5760 acres (23 sq km). Apart from mining Chewton kept only one other large industry, a tannery, which operated until about 1914. Between 1900 and 1920 Chewton’s population fell by more than one half to about 500 people. When the borough was created there had been over 3000 people, and on 2 May 1916, it was united with Metcalfe shire. Chewton has a large stock of historic buildings, brought about by their original stone or brick construction and by the absence of redevelopment in a slowly declining town. A heritage study in 1994 identified over 45 sites, ranging from ones worthy of note to ones qualified for inclusion on historic buildings registers. They included railway structures, churches, old shops, civic buildings and cottages. The Victorian Heritage Register lists the former town hall (1861), the former post office (1879) and the Garfield water-wheel base (1887), built for a 222 bucket, a 22 metre diameter timber wheel for a gold mine. Many of the historic sites straggle along the winding linear main road, interspersed with gravelly and up-turned mining land. Red Hill, near the middle of the town, was a rich gold field. Chewton has several shops, a hotel (1854), sport and recreational facilities, a swimming pool (reopened by the community in 2011), two churches, a school with 39 pupils (2014), and the Wattle Gully gold mine about 1 km south of the town. The Chewton community has an active historic and heritage group which documents and agitates for preservation of buildings and mining relics. There is a weekly community market at Wesley Hill, 2 km west of Chewton. About 3 km to the north is the Expedition Pass reservoir. The pass was named by the New South Wales Surveyor-General, Thomas Mitchell on his homeward journey in 1836 from Australia Felix in Victoria’s Western District. The pass is marked by a monument, and is near Golden Point, a rich gold-mining locality of the 1850s.